Peel, wash and cut the malanga into small pieces. Sauté the onions and garlic in olive oil in a pot. Add the malanga and the broth. Let boil over medium-high heat until the malanga is completely tender. Remove from the fire and pour the contents into a food processor or blender. Blend until you achieve a smooth and creamy consistency. Pour the cream back into the pot, but this time over low heat. Add the cream and salt/pepper to taste. Cook for 5 more minutes. Serve hot with a little bit of ground nutmeg. You can serve with a bit of fresh chopped cilantro. You can also add 1/2 cup of cooked pumpkin. You can use vegetable broth instead of chicken broth. You can also use 2 cubes chicken bouillon diluted in 5-6 cups of water. 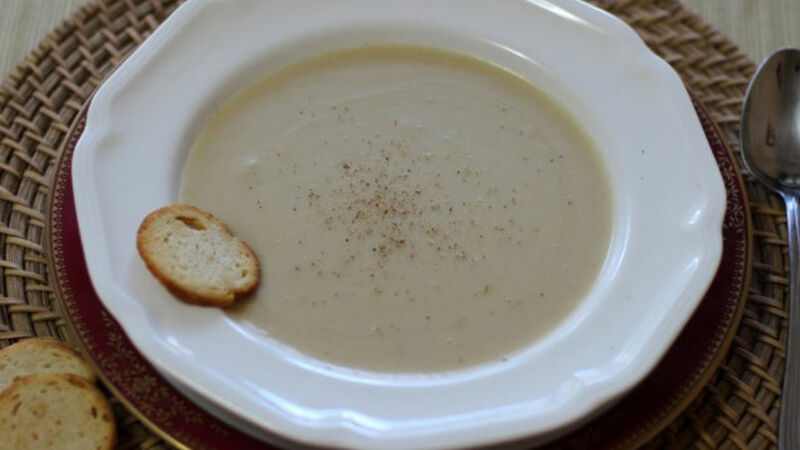 This creamy soup recipe is one of my favorites for this time of the year. You might be surprised to find how many combinations and uses this creamy soup has. Like a lot of recipes, you can adapt this one and make an entirely vegetarian dish using a vegetable broth base. You can also add a chunk of ham to give it a different. The result will always be delicious!